Shihabuddin Muhammad Shah Jahan Badshah Gazi was the fifth Mughal ruler of India. He ruled India from 1628 CE until his death in 1658 CE. The reign of Shah Jahan is considered to be one of the glorious periods of Mughal rule in Indian history. He is well known for the beautiful ‘Taj Mahal’ which was his creation. Shah Jahan issued coins is all three metals: gold, silver and copper. He issued coins in various shapes like round, square, mehrab and lozenge. In copper he issued denomination like: Two Falus, Falus, 1/16 Dam, 1/8 Dam, 1/4 Dam, 1/2 Dam, 2 Dam and Dam. 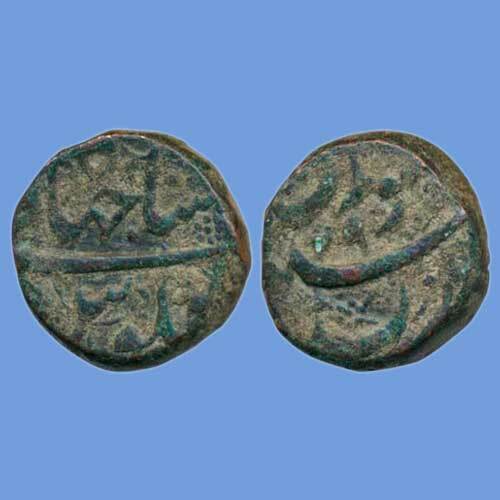 Copper coin issued by him had the King’s Name and title which was written as ‘Falus ShahJahani’ but very few copper coin has a legend ‘Sahib-Qiran Sani’ inscribed on the obverse of the coins. Mint name is placed on the reverse of the coin.